The AWA together with the Manly Yacht Club and Windsurfing New Zealand are pleased to bring you the North Island Cup for Slalom. This will be a one-event competition held on Saturday 16 and Sunday 17 February 2013 at Manly Beach Whangaparaoa Auckland. This event will be held together with the RXS and Techno Nationals and Formula racing, also competing on Friday 15 February. 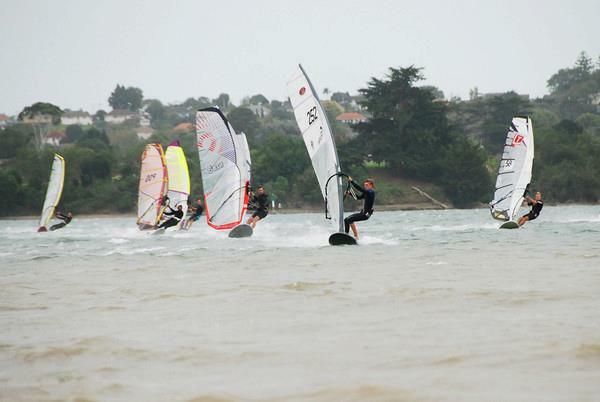 Barfoot & Thompsom ,Whangaparaoa Branch is sponsoring the whole event with over $4000 in prizes to RSX/Techno, $1800 in prizes to Slalom, and $1000 in prizes to Formula. Prizes are in the form of cash and local windsurf shops vouchers. This is huge for the sport and a weekend you will not want to miss. The beach will be full of windsurfers of all ages and abilities competing in their respective classes with Gold and Silver fleets catered for in the North Island Slalom Cup. The event race schedule on Saturday and Sunday will allow competitors to compete in Slalom and in one other class. In the likely event that the wind in the mornings will be lighter, RSX and Techno sailors will be commencing racing around 10.30am and be completed by 2.30pm when the slalom schedule will commence. Of course there is a change that the wind gods have other ideas so slalom racing could be on earlier or later if the wind is particularly strong when we are least expecting it. It's that time of the year when sea breezes can provide for a slalom sailors dream ride so don't miss out and mark your diaries now to come and enjoy the fun and competition in the beautiful location of Manly Beach. The earliest possible start time for slalom racing on Saturday and Sunday is 12 Noon. The slalom entry fee is $50 for both days. This also gives you entry to the two social events (including food and some drinks) on Friday and Saturday nights at the Manly Yacht Club. Knowing how much my kids eat, I think I'll enter them just to feed them for the two nights. Entry forms must be in and paid by Wednesday 13 February so that we know the numbers for catering. The entry form will be out soon. You can choose to race on only one day but in order to be eligible for a placing, you must compete on both days, assuming racing is held. The registration desk will be open from 10 to 11 am on each day to confirm your registration for the day s racing. No entry forms will be accepted on the day. Gold and silver fleets will be catered. The silver fleet is dedicated to those competitors racing for the first time, those on non-dedicated slalom gear or based on ability level. Women will be racing in the silver fleet and compete for the Women s North Island Cup 1st, 2nd and 3rd placing. Women 1st women $350 voucher and North Island Cup Women s Trophy 2nd women $150 voucher, 3rd women $100 voucher. Silver Fleet Men 1st men $150 voucher, 2nd men $100 voucher, 3rd men $50 voucher. 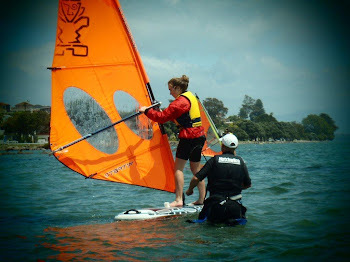 No wind entertainment will include SUP races, rigging races, Slalom clinics and a windsurfing general knowledge pub quiz. Start swatting up on your windsurf general knowledge. Come on up to the event and be part of the spectacle at the spectacular Manly beach. It s a great place to bring your families with a large grass area and a beautiful and safe beach. The Notice of Race and Sailing instructions will be out next week. Accommodation can be arranged for those coming from out of town.